I turn my phone completely off – not just put it on silent – when I’m on an airplane. I give back extra money when a grocery story clerk miscounts my change. I follow rules. I’m a law-abiding citizen. Every Easter, I go on an Easter Egg Hunt throughout Manhattan and buy Kinder eggs for my children. Kinder eggs are illegal in the United States. Or legally banned for import depending on whom you speak with. 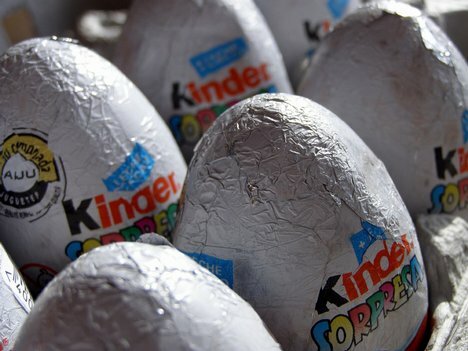 It’s because Kinder Eggs – made by Ferraro – have tiny toys in them posing a choking hazard. I figure because I’m their parent and I already gave them a talk about being careful when eating one, I can continue their tradition of having Kinder eggs during Easter. So as long as Kinder Surprise is for sale in Manhattan and my kids continue to love them and behave appropriately when eating them, I plan on buying them. I’ve never heard of Kinder Eggs. Is it just a solid chocolate egg with a toy inside? Kinder Eggs are hollow chocolate eggs with a little toy within the egg inside an oval capsule. Interesting- never heard of ’em! Will have to let you know if I ever see them in the DC area. Since you’re so law-abiding 364 days a year, breaking a teensy rule for Easter is totally OK! Victoria, I’ve never heard of Kinder eggs either. I can see why they would be hazardous if a parent is not paying attention, but they look like a fun way to have your chocolate & toy surprise too. Kinda like finding the ring in the middle of a King cake for Mardi Gras! I’ll look for them. Living in the city that never sleeps keeps me busy. This blog is a look at what I'm doing (almost) every day. (c) 2009-2011 247Victoria.com Unauthorized reproduction of anything I've written is not allowed. Really.